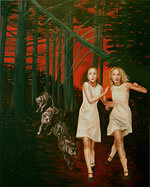 These girls depicted in their nightdresses appear lost in the woods -- are they sleepwalking? -- or are you the viewer encountering these forest spirits in a dream world? 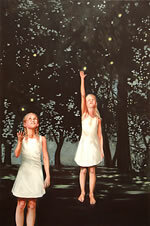 The young girls are a metaphor for innocence and vulnerability, protectors of untrammeled nature. The forest they inhabit is at once a refuge from, and a symbol of the dark unknown, both of the unconscious and the greater darker side of our present world, menaced by terrorism, wars and global warming. An archetypal place in human history, the forest is a place of endless mysteries-- seemingly empty, yet teeming with life. It is a kind of life, however, perceptible only to those open to the acceptance of the immaterial. Upon entering a forest we are in a domain we cannot fully control, a place that answers to its own rules. We cannot see past short distances, the light constantly changes and the trees become personages of their own right. Certain areas emanate special powers that have given rise to the ancient rituals for many different peoples of the world. In most of the West, alas, the introduction of Christianity eliminated the belief structure that acknowledges the presence of such forces. Not so in Japan, however, where the Shinto religion, which can be seen as a "religion of the forest," honors the traditions of this indigenous national believe system to this day. It is thus most fitting that the painter Rene Lynch, who chose the forest as a staging ground for her most recent series of paintings, is honored by an exhibition in Japan. 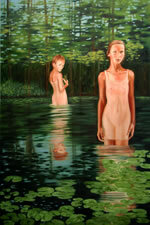 The series is called Secret Life of the Forest (2006 –7), and the feeling of mystery is at the core of each piece. 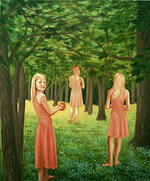 As in the other series that Rene Lynch created in recent years, the subject of her work are adolescent girls nearing the threshold of womanhood, full of anticipation but also reluctance to enter the adult world that will forever rob them of their innocence. The change is unstoppable and it is with nostalgia that we look at these young women-to-be sometimes wishing for them, and ourselves, to slow the process in order to prolong the dreams untarnished by reality. These young girls are stepping into the roles of their lives, their faces suggesting the personalities they will soon assume and they will live with through their adult lives. Placed in a special moment in life they still seem to be dreaming the time away but there is already a purpose in many of their gestures and expressions. In recent of Lynch's paintings, it is no longer only the adolescent girl, who is the main theme of the work - the landscape that surrounds her is becoming equally important. In a masterful way Lynch creates stage sets for the girls to play out their drama of growing up. 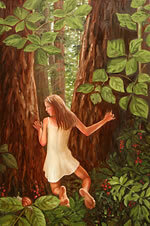 In Secret Life of the Forest (Morning) the trees become the girls' companions and support. Gentle mist envelopes the whole scene. There is an interesting relationship among the three protagonists – the girl in the foreground is looking at the viewer directly in almost an accusatory manner – is the viewer an intruder set out to disturb the peace? Is he/she going to awaken the dangerous forces presently kept at bay? Not depicted as a full figure with the emphasis on her torso and the facial expression, this young woman is tied to Lynch's earlier series called Gaze. In these the artist concentrates on the face of her models and within the face the eyes assume a special prominence. Their expression suggests the type of a person depicted, creating an almost iconic portrait of a character. Is the girl in Morning trying to communicate to us that we are not welcome, is she a gatekeeper protecting the two girls in the background? They seem to be absorbed in their own worlds not communicating with each other. As in many of Lynch's works, there is no direct answer to any of these questions. The ambiguity itself seems to be one of the prevailing themes. In Secret Life of the Forest (Visitor) the atmosphere created by the pale light and transparent mist is magical. 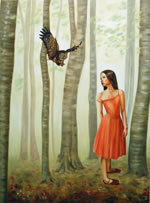 While in many of Lynch's paintings there does not seem to be a deliberate disconnection between the elements of the work, here is a definite implied dialogue between the girl-child and a ‘visitor' personified by the large descending owl. The girl's expression is not welcoming – although the analogy to the Annunciation is clearly implied, the reception is not joyous but full of apprehension. What makes this work further unique is the girl's dress – it is not the simple pale shift that clad most of the other artist's characters but a fitted red dress worthy of a ballet dancer. Never mind that the girl seems unaware of a slipping shoulder strap and that she twists awkwardly her right ankle. She is a budding beauty of determined expression that will soon use her charm as a great asset. In another work of the series called Golden Apple the sleeping beauty is offering us the forbidden fruit in no uncertain gesture. 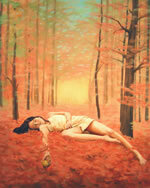 The girl is caught in the most vulnerable moment; while sleeping on the forest floor covered with deep layer of red leaves she is entirely defenseless. Is it the apple that is her secret weapon? Not entirely golden fruit there is a golden glow emanating from the central background of the piece to lure us into the world of the fantastic abandon. There is great degree of eroticism in this piece, a concealed recognition of sensuality that will spring to a full power with the girl's awakening. Contemplating this work one inevitably recalls some of the imagery present in the enigmatic work of Balthazar Klossowski de Rola, (l908-2001). This French painter known as Balthus, created some of the most enigmatic figurative works of the 20th century, often depicting young woman discovering the irrepressible power of their sexuality. 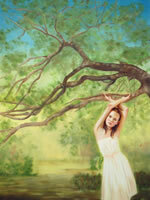 Among the works of the series but not in the exhibition there is an exceptional painting called Dusk. 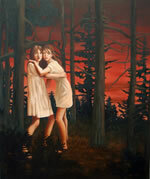 The forest here is not dreamy and/or misty, but downright threatening, and the girls respond by embracing as if hoping to find strength in each other. But the embrace seems to be not really heartfelt, there is not much of a connection between the two. The isolation of an individual still reigns. The girls look out from the painting but not at the viewer, their gaze turned upwards as if anticipating an intruder from the sky, some kind of airborne danger. The forest is dark and forbidding, the sky is red as if the land was ravaged by fire. The war is on the march, destructive and menacing – the painting is becoming a symbol of our troubled times. The strong narrative of Lynch's work should not obliterate the exquisite technique employed. 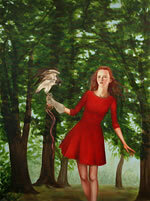 Rene Lynch is a figurative painter par excellence who respects the rules of a very hard profession. She created studies from the models, many of whom she works with repeatedly as they possess the particular qualities the artists is seeking to portray. But the figures that ultimately appear in the paintings are not true portraits – frequently they are composite images of features of several models joined together. They were selected to convey particular type of person conflating the world of adult and that of the adolescent. The brushstroke is even and fully controlled to create a smooth, unified and most often a matte surface, not dramatizing any part of the work. Although in the past the space was not emphasized, more recently it is developed into greater depth inviting the viewer to enter the scene. Lynch also creates a profusion of exquisite watercolors in which the space is treated differently as the figure is usually placed off center to allow for other attributes to fill the page. The large areas of white set off the brilliant colors of depicted objects. These works on paper allow the artists to display her draftsmanship of great precision. In Cat and Mouse the title reveals the content. It is a cruel piece and so are the knowing and prematurely adult eyes of the girl who swirls through the page teasing the cats and torturing the mouse. It is a part of the Wonderland Series of 2007. "My title Wonderland directly refers to that sensual dream world which connects one to the deeper universe of nature…It is falling through the rabbit's hole into the a world transformed by the heightened reality of a butterfly's wing and the balance between beauty and decay and innocence and experience." Our world is greatly enriched through Lynch's astute observations. from the series "The Secret Life of the Forest (Trail of Crumbs)"
from the series "The Secret Life of the Forest (Dusk)"
from the series "The Secret Life of the Forest (Falconer)"
from the series "Secret Life of the Forest (Visitor)"
from the series "The Secret Life of the Forest (Golden Apple)"
from the series "The Secret Life of the Forest (Secret)"
from the series "Secret Life of the Forest (Black Water)"
from the series "Secret Life of the Forest (After Dark)"
from the series "The Secret Life of the Forest (Offering)"
from the series "The Secret Life of the Forest (Clearing)"
from the series "The Secret Life of the Forest (Beehive)"
from the series "The Secret Life of the Forest (A Different Sleep)"
from the series "The Secret Life of the Forest (Sway)"
from the series "The Secret Life of the Forest (Deer)"
from the series "The Secret Life of the Forest (The Pack)"
from the series "Secret Life of the Forest (Fireflies)"
from the series "Secret Life of the Forest (Morning)"
from the series "The Secret Life of the Forest (Passage)"
from the series "The Secret Life of the Forest (Encounter)"